Product prices and availability are accurate as of 2019-04-04 01:02:46 EDT and are subject to change. Any price and availability information displayed on http://www.amazon.com/ at the time of purchase will apply to the purchase of this product. 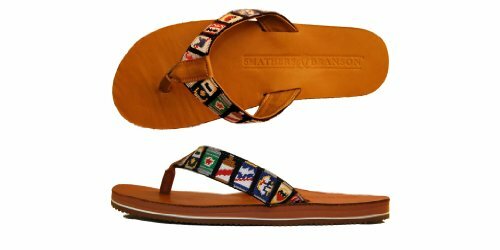 The original handstitched needlepoint flip flop sandals from Smathers & Branson. Engineered for maximum comfort, stylishness, and durability. Fashioned from top grain cowhide. Each strap is composed of handstitched needlepoint with a supple pigskin lining on the underside for added comfort. Memory foam toe post and EVA foam construction create a personalized fit that molds to the foot with wear. Needlepoint thread doesn't bleed when wet. Non-marking mock-needlepoint rubber sole.